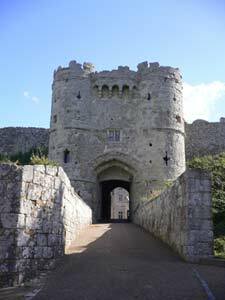 One of the main tourist attractions in the Isle of Wight, Carisbrooke Castle is a brilliantly preserved castle best known as the place where King Charles I was imprisoned. The castle has stood for over 800 years and resisted a siege by the French and fought off attack from the Spanish Armada. There has been a fort at this site since the Saxons however work began on the current castle in 1100 when the Isle of Wight was granted to the de Redvers family who made many improvements to the castle including the building of the stone keep and rebuilt the whole of the stronghold after which Carisbrooke experienced a siege in 1377 by the French and in 1588 by the Spanish Armada which prompted an update to the castles artillery fortification by surrounding it with 'bastioned' outer earthworks which can still be viewed. During its 800 years Carisbrooke has had numerous residents most famously King Charles I when he was held prisoner at the castle after his defeat in the English Civil War. He was held from 1647 until 1648. Later in the castle life Queen Victoria's youngest daughter, Beatrice became Governor of the Isle of Wight and chose to make Carisbrooke Castle her summer from 1914. You can visit the castles gardens designed by television garden presenter Chris Beardshaw which have been named after Princess Beatrice. Another stamp left by Princess Beatrice is the altar painting in the castle chapel which was painted in memory of a soldier killed in action in 1914. Inside the castle is Carisbrooke Museum which provides visitors more historical information about the castle, as well as Charles I memorabilia comprising of personal relics, documents, prints, and armour. TIP -Don’t miss the daily donkey demonstrations at the wheel house where they operate an Elizabethan wheelhouse which raises water 49 metres (161 feet) from the well beneath. There are all the ingredients here for a great value family day out in the Isle of Wight. Children will love dressing up as Norman soldiers or Civil War troopers, and meeting the castle's famous donkeys, while for the grown-ups, the new Edwardian style Princess Beatrice Garden is a joy.